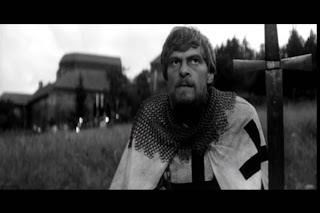 The same year Frantisek Vlacil completed his epic production of “Marketa Lazarova” (1967), he also managed to write and direct another medieval drama intended to get some extra mileage out of the sets and costumes. 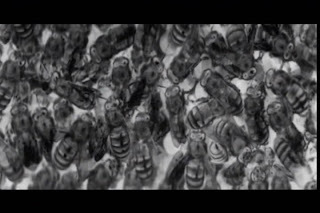 While this film, “Valley of the Bees” (1967), is not nearly as awe-inspiring in scope and intensity, it is more accessible both artistically and physically (Facets has an above-average region 1 release). The picture opens with Ondrej as a child, beekeeping by his father’s minor castle. 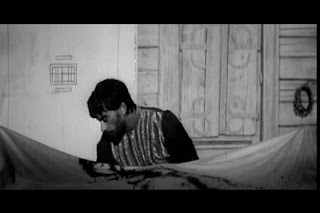 Upset that his dad is about to marry a young girl, he hides bats under the flower petals of a wedding gift and sends his father into a murderous rage. 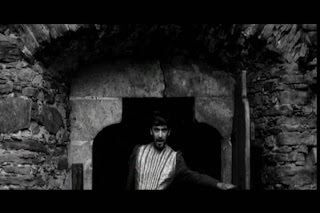 Nearly dead, Ondrej is promised to god by his guilt-ridden father. This sacred vow consigned Ondrej to knighthood in a holy order by the sea, a life he is less enamored with than his dashing mentor Armin. After much soul-searching and a brush with insanity, the matured Ondrej escapes, eventually finding his way back to his homeland and the role of patriarch that awaits him. 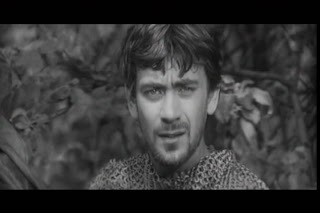 Armin hunts him down, arriving in time to interrupt Ondrej’s blasphemous marriage to his step-mother. In the tragic conclusion, both men must make difficult decisions about love, friendship, faith and honor. 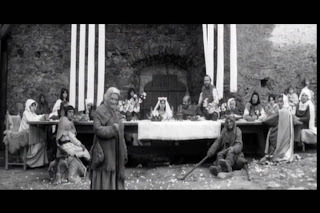 “Valley of the Bees” is essentially a conflict between secular life and religious devotion, but expertly framed as a character drama about divided friends and conceived within the mindset of the middle ages. Contemporary bias and priorities are largely avoided. Ondrej, quite reasonably, desires his freedom, family, territory and chance at happiness. He shows every indication of being a capable ruler, provider and husband, though his actions can be seen as cowardly, not to mention oedipal. Armin is a man of true faith and unswerving duty, but his determination and inability to compromise make him ruthless and oppressive. This difference in personality ultimately pushes their friendship to the breaking point, causing both men to make terrible sacrifices for the sake of their sincere convictions. 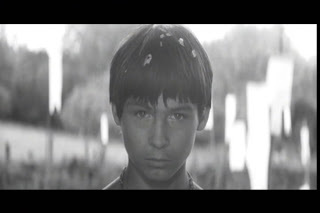 In keeping with its metaphysical and ideological themes, “Valley of the Bees” has more contemplative tone than “Marketa Lazarova.” The backdrop is still brutal and unforgiving, marked by poverty and abrupt death, but the pace is relaxed and the acting restrained. The fragility of this calm is revealed through the sudden changes that come bursting through the equilibrium and the swift punishments that follow errors in judgment. This is perhaps best appreciated by observing Vlacil’s motif of people getting torn apart by dogs, accounting for a [record-breaking?] 3 out of 4 major deaths in the film. 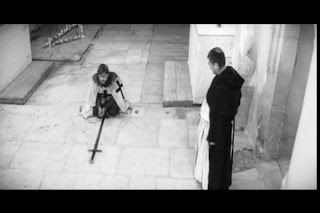 The looming danger and fear that mark the dark ages is, however, tempered by two systems that appear to provide a path out of the chaos and misery: the monastic life of extreme discipline and the material consolidation of personal power. There seems to be few bridges between the two extremes and it’s interesting to note that the only sign of the live-and-let-live values now considered progressive is a priest whose moral flexibility makes him one of the least likable characters. 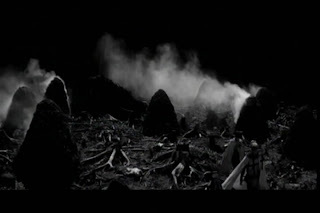 Inevitable tragedy manages to demolish any chance of hope and harmony, but the final shots acknowledge the human capacity for endurance and even rebirth. Artistically, Vlacil continues to impress me with his maverick marshaling of sights and sounds and I’m coming to regard him as one of the great masters of cinema. (I dare say I like his work more than the early films of Milos Forman and Ivan Passer, who are probably better known due to their later success in America.) 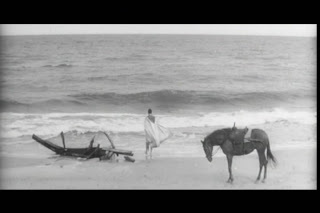 The composition is up to the level of “Marketa Lazarova,” but it’s colder and more austere. There’s less focus on the influence of nature and more attention on mankind. 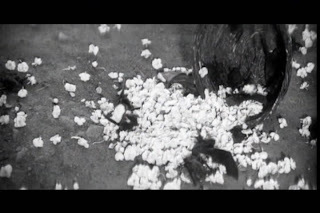 Even the bees that occupy the title and quite a bit of the soundtrack, serve mostly as a metaphor for the pockets of collective effort that are gradually taming the land. The mood is maintained less by the forest and marshes than by stoic close-ups and stone structures. Vlacil lighting is extremely precise, effectively using the contrast of light and shadows as inseparable but irreconcilable sparring mates not unlike Ondrej and Armin. 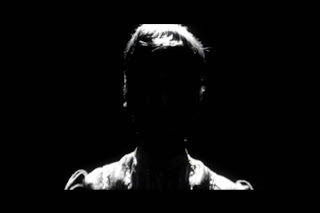 In keeping with the natural conditions of the era he leaves night-time scenes and interiors very dark, often taking advantage of thresholds for framing dark figures against rear lighting and light figures against receding blacks. White and black also have important character associations. Armin, for instance, is associated with purity. 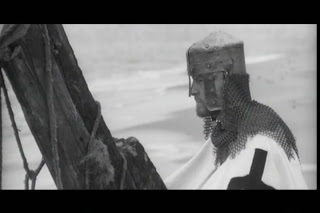 He has blonde hair, prefers the white cape of the order and rejects the temptation of heterosexual love during a chaste encounter with a blind, fair maiden. Ondrej and his bride have dark hair and dress in thick gray furs that give them an earthy aura in line with their worldly concerns. Ondrej and Armin show a fascination for light, staring into fires, the glittering ocean or the sunlight that cascades through windows. Both describe a fire within, a burning that they can’t quite understand. Armin associates it with the crusades and his spiritual devotion, reflecting his restlessness to redeem his friend. For Ondrej the inner fire drives him to pick up his father’s torch, returning home to restore his community and marry his mother, though it may also represent his guilty conscience. The lighting enriches compositions that are often relatively minimal, similar to the observant styles of Bresson or even Flaherty. 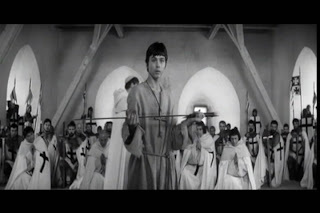 Often Vlacil harnesses the sharp jab potential of individual symbolic props, like a gaunt wooden crucifix, a chalice or a bed. 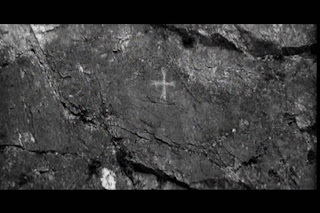 The most frequent and versatile of his repeated images is the cross, a fixation for Armin and an omen for Ondrej. 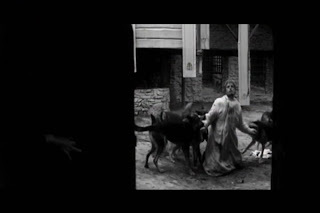 As with “Marketa Lazarova” the music of Zdenek Liska and the sound design are integral parts of the film’s tone. Whether it’s Gregorian chant, children’s choir, swarming bees or grave silence, the soundtrack always has a sense for the monumental; somehow detaching us from the characters and dwarfing them. It reminds us of the beauty and surrealism in what, in the hands of a less skilled director, could have been a mundane and ugly period piece. 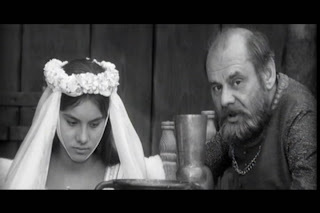 I recommend “Valley of the Bees” for anyone even slightly curious about Frantisek Vlacil, but not in the position where they want to commit to Second Run’s Region 2 DVD of “Marketa Lazarova.” It’s the perfect place to start and leaves me optimistic about trying Facets other Vlacil releases, “The White Dove” and “Adelheid,” though I hear those transfers are less impressive. 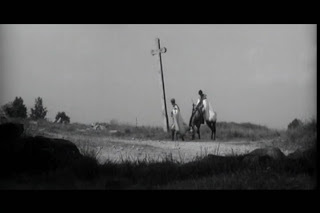 I've never seen any of Frantisek Vlacil's films but thaks to your review I now want to. The images are really spellbinding. This is, so far, the only Vlacil I've seen, but it is very good indeed. 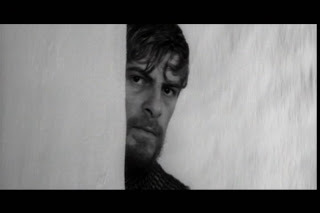 Interestingly, when I last checked, this film was higher rated than Marketa Lazarova on CSFD. Hello! I've just watched this film and found it outstandingly relevant. One thing I'm confused about is the end of the film, however. I don't wish to post spoilers, but there's a certain ambiguity in the last scene (especially with the clothing) that I would like to discuss with someone.Please e-mail me at wilmarie.cruz@upr.edu Thanks in advance!